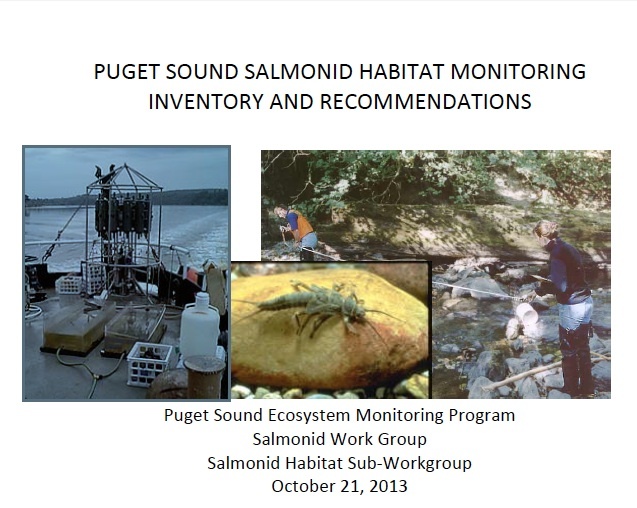 An October 2013 report released by the Puget Sound Ecosystem Monitoring Program inventories and assesses monitoring activities of Puget Sound's ESA-listed salmon and steelhead stocks and habitats. "The goal of this habitat report and the previous Viable Salmonid Population report was to conduct an inventory and assessment of current monitoring activities that will assist in providing statistically sound data on status and trends in the abundance, distribution, and survival of Puget Sound’s ESA listed salmon and steelhead stocks and the habitat in which they live, and to provide recommendations for coordinating the needs of recovery plan monitoring at the watershed scale. A survey of ongoing habitat monitoring geared toward salmon habitat recovery was conducted between January 2012 and the spring of 2013. Meetings were held with the recovery entities in the various watersheds of Puget Sound to obtain directly from them the ongoing monitoring components they have been implementing. The amount and quality of monitoring varies widely across the watersheds due mostly to funds available and the number and expertise of those individuals leading the habitat restoration and monitoring efforts in the watersheds. A Salmonid Habitat Sub-Workgroup was created and used to develop a habitat status/trend monitoring approach for salmonids in Puget Sound. This effort was funded through an interagency agreement between the U.S. Environmental Protection Agency and the National Marine Fisheries Service."